When it comes to the kings and queens of Game of Thrones, it seems like everyone and their mother is gunning for the throne in some shape or form. We've seen three Baratheons (though one actually was king), four Lannisters, House Tyrell, and what I'm assuming was all of Dorne go down in the battle for the Iron Throne, and the only person who's made any progress is Cersei Lannister - and we all know that's not going to end well. Now that we're quickly approaching the final season, the question on everyone's mind - even the characters themselves - is who will finally claim the Iron Throne? 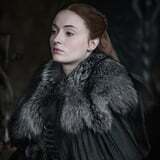 The answer may have been under our noses all along: Sansa Stark. Since her first introduction, Sansa's narrative centers on queenship. As a tween, she's preparing to be a southern princess and marry Prince Joffrey. She's admittedly at her worst during the beginning of season one, but she's also around 13 and spoiled, so that isn't a massive surprise. After the death of her father and the beginning of the War of the Five Kings, everything changes. As we've seen, Sansa has the honor and steel of her father and mother, while understanding what got them killed. She's ruthless and supports her family's interests, like Cersei, but is more compassionate and concerned about her people. Petyr Baelish taught her to be sly, but she knows better than to burn as many bridges as him. And if she were to ever sit on the throne, there's no doubt she would be wary enough to surround herself with people she can trust - like Brienne of Tarth, Arya, and even Tyrion. Honestly, with a crew like that, Sansa could be the greatest queen the Seven Kingdoms have ever seen.